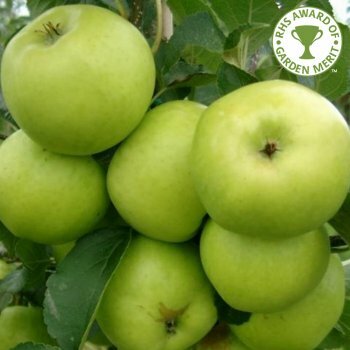 Apple Grenadier is a delicious green cooking apple that cooks down to a pale, fluffy, white puree. The flavour is good with a sharp edge and ideal for jams and pies. Apple Grenadier is from Buckinghamshire in the 19th Century. Although the keeping period is short you can make a huge batch of puree with these tasty apples and freeze it for the months to come. Expect heavy crops from Apple Grenadier in mid August. Apple Grenadier requires a pollination partner in group A, B or C to be within a half mile radius. Grenadier is in pollination group B and requires a suitable pollinator within a 1/2 mile radius. Apple trees should be spaced according to their rootstock, for example an MM106 (semi-vigorous) rootstock will require approx. 4.5 metres between trees, whereas an M27 (very dwarf) rootstock will require approx. 1.5 metres between trees.